One of the figureheads of early Italian Rennaisance is Andrea Del Castagno, a Florentine artist who became known for how emotionally powerful his works are and his naturalistic treatment of the figures in it. His art was influenced by Masaccio and Donatello. He is the leading figure in Florentine Renaissance of the disegno tradition and has done many religious frescoes during his short lifetime. His real name was Andrea di Bartolo di Bargilla and was born around 1420, in Castagno, Italy. Because a lot of information and works have been lost since that time, little is known about his early life: Who his parents were and how he was trained as an artist. Historians agree, however, that he was influenced by Tommaso Masaccio, which could explain their art having more naturalism and humanistic aspects that are recognized as basic descriptions of traditional Florentine art, though because he was just 8 years old around the time Masaccio died there was no way they would have met. Masaccio, however, personally knew Donatello, another artist that had a profound impact on the art of Castagno. Castagno lived from 1420 to 1457 so he must have known about the works of his contemporaries like Fra Angelico and Filippo Lippi, both are also Early Renaissance artists. Castagno found work in 1440 under Bernadetto de’ Medici’s payroll, a member of the powerful Medici family. He then transferred to Florence to start his first work, which is a murals series about the execution of the rebels that were captured after the then Battle of Anghiari during the war between the city of Florence and the city of Milan. This first work gave him Little Andrew of the Hanged Men as nickname or Andreino degli Impiccati. For the rest of his career he mostly painted frescoes, the earliest known being the Crucifixion and Saints found in Ospedale di Santa Maria Nuova. Then there are the frescoes at the San Zaccaria’s San Tarasio Chapel in 1442. He painted Death of the Virgin fresco in St. Mark’s Basilica a year later during his visit to Venice. One year after he got back from his trip to Venice he painted Madonna and Child with Saints fresco. It was also at this time that he was admitted into the Guild of the Medicians. One of Castagno’s best works was the frescoes he made for the Convent of Saint Appolonia’s refectory. It involves scenes from the Passion of Christ, like The Last Supper and The Resurrection. here he displayed Masaccio and Donatello’s influence in his art by showing how he uses linear perspective and pictorial illusionism. Around the late 1440s, Filippo Carducci commissioned him to paint larger-than-life-size Renaissance portraits of well-known people for a loggia in the Carducci Pandalfini villa. The project, which includes nine portrait frescoes, was finished on the October of 1451. These people were the Cumaean Sibyl, Queen Esther, Farinata degli Uberti, Niccolo Acciaioli, Pippo Spano, Petrarca, Boccaccio, Dante, and Queen Tomiri. He painted them in such a way that they looked like sculptural forms. Then in 1450 he finished his tempera-on-leather painting, The Youthful David. In 1451, he finished the S. Egidio Church frescoes started by Domenico Veneziano, his friend. Castagno painted two altar frescoes, The Trinity Appearing to Saints Jerome, Paula, and Eustochium and St Julian Receiving Absolution From Christ, for the Basilica della Santissima Annunziata in 1455. In this project, he painted with a lighter tone that’s more associated with his friend Veneziano. The work was noted to have been balanced and calm.” However, the completed work has the figures more intense, more emotional. 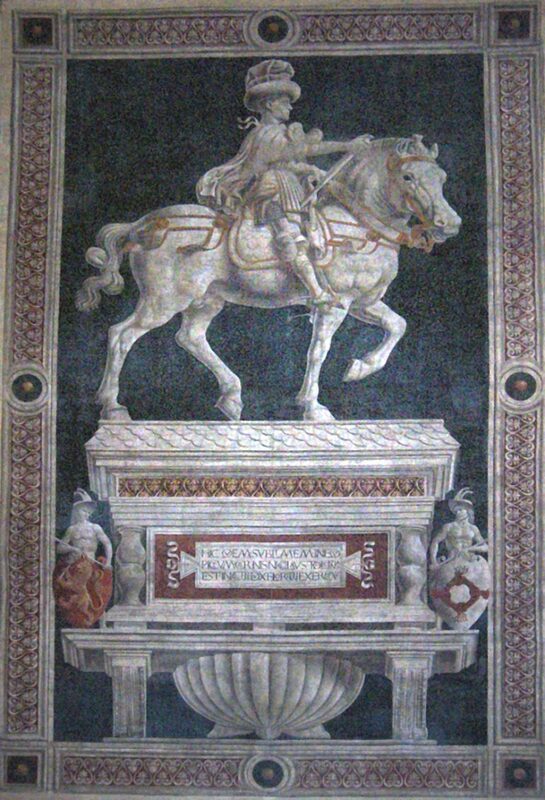 During this time he also painted the fresco Equestrian Portrait of Niccolo da Tolentino for the Cathedral of Florence. This is the last known work that he had before dying two years later.